Fraternal twins Rachel and Sarah Gross had a vision for a new Cleveland-area bagel shop that involved their own bagel recipe and award-winning cream cheese. As fifth-generation Cleveland-area residents and members of The Temple-Tifereth Israel in Beachwood, the interest developed from a family history of Jewish cooking and an uncle’s own out-of-state bagel shop concept. Things didn’t quite work out as planned. After searching for shop locations for years and fine tuning their cream cheese recipe, Sarah was still working “odds and ends” jobs and Rachel was substitute teaching. Then, last August, they received a promising lead. Within 24 hours, they were negotiating, and in December, they started their first day as owners of Bialy’s Bagels, a more-than-50-year-old community institution in University Heights. Now, it’s all about preserving the shop’s legacy while adding their own touch. 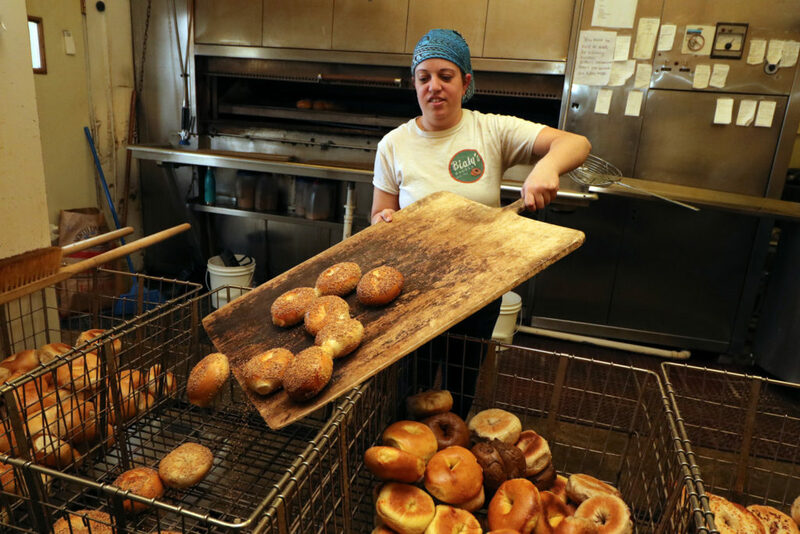 Rachel Gross removes bagels from the oven and adds them to the dozens made each day at Bialy’s. On a Thursday afternoon in early March, as Rachel and staff finished up the day’s bagel batch, she explains the dynamic is still new. In fact, Sarah was out buying a laptop so they could begin taking care of the business in-house. Ellen and Mark Osolin, the former owners, had worked alongside the Grosses, 33, through mid-February, but now they were on their own. The vibe in the kitchen was spirited, with a combination of hard focus on the bagel-making process and an intense friendliness toward anyone walking in. Interacting with several customers over a couple hours, the sisters’ demeanor was so warm it’d be difficult for an outsider to discern whether each person dropping in was a friend, new patron or something in between. The sisters say their “yin and yang” dynamic makes the division of responsibilities natural. Sarah tends toward getting down to business – during an interview, she often stepped away to make calls and take orders – and is more reserved, while Rachel is more laid back and chatty. Sarah concurred, adding she’s best suited for dealing with any complex business or customer-related issue that arises, whereas Rachel better handles regular day-to-day and front-of-house operations. And despite living together in South Euclid since 2009, they don’t really get sick of each other. “It’s nice to always have a friend,” Sarah says. While growing up in Pepper Pike, the twins say their grandmothers each had signature dishes that helped them develop an interest in cooking. They also regularly visited an anesthesiologist uncle in Winston-Salem, N.C., who had opened a bagel shop after noticing there was nowhere to buy bagels on his way to work at a hospital. The bagels were made in-house and made-to-order sandwiches were offered, too. 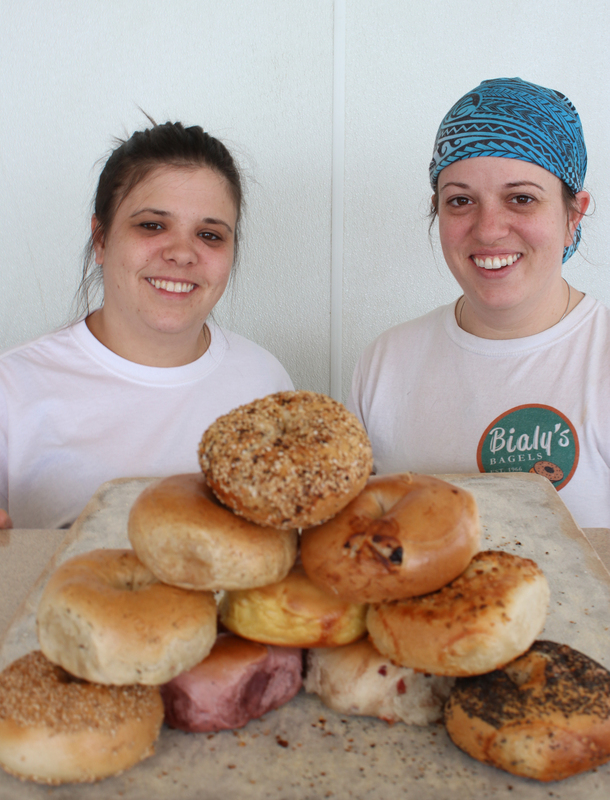 Out of all Cleveland-area bagels, they are most similar to Bialy’s, the sisters say. 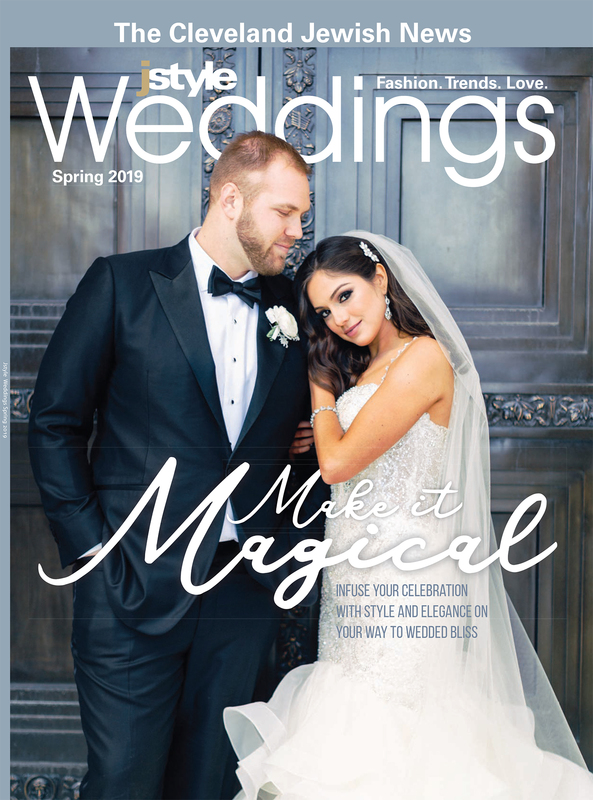 In the midst of perfecting a bagel recipe – “I taught myself to do it at home,” Sarah says – the sisters started experimenting with adding interesting ingredients to flavor store-bought plain cream cheese. Rachel was working at Jeni’s Splendid Ice Creams in Chagrin Falls at the time and ended up meeting its founder, Jeni Britton Bauer. She and Sarah served her Bialy’s bagels with an experimental Parmesan and truffle cream cheese they made. In May 2014, the sisters launched Clover Road Cream Cheese in Kent. They used cream from Ohio-based, grass-fed cows, and for a couple years, they sold their cream cheese at area farmer’s markets and Metropolitan Market in Pepper Pike. However, production ceased in early 2016, Rachel says, citing structural damage to their facility, which made it difficult to get cream. Since making cream cheese was a part-time gig and both sisters had other jobs, the dream of working together on something bagel-related once again moved to the backburner – until a serendipitous tennis match. Last August, a family friend found herself playing tennis with someone she had never met before: Ellen Osolin, the former owner of Bialy’s. 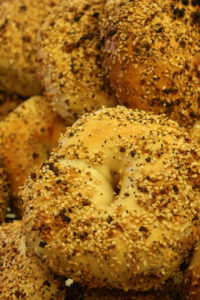 Osolin’s late father, Terry Skolnick, opened Bialy’s in 1966 as University Heights Bagels and Bialys. Ellen and Mark Osolin took over the shop in 1997 but had been looking to sell to free up time to spend with family. During the chance on-court meeting, Osolin mentioned she was trying to sell a bagel shop and the family friend told her she knew “the perfect people” to buy it, Rachel says. The friend told the sisters, who immediately got on board and worked to reach a deal. Game, set, match. One challenge for the sisters thus far has been adapting to taking over an existing business rather than developing their own, Rachel says. Bagels that await their turn in Bialy’s oven. Sarah adds, “The main thing is we do not have an office here,” as they joke that they don’t know where to set it up. Ellen Osolin handled business and finances out of their home while Mark ran the shop, but the sisters both want to work in house. 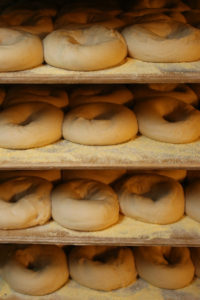 A larger, overarching challenge is making Bialy’s their own while also preserving its legacy. The bagel recipe will not change. They dropped the “Buster’s” name yet designated it for their coffee. Also, their elusive cream cheese needs to find a way back into production, Rachel says.